633. Where is your Offertory going? This is the most common Bible verse that is read aloud in many churches before the offertory is collected. But do you know where your offertory is going? Many churches are doing a great work by helping the needy people and by doing the great commission. But there are some thieves who use God's money for themselves. Just look at the above picture. Can you notice the similarities in the lip structure of both these people. Yes! 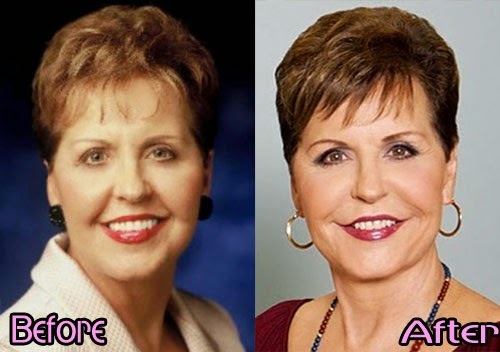 Joyce Meyer has used the Church money to augment her lips. She has done this procedure to add beauty to her smile. Back then, when she used to smile, her full frontal teeth will be visible for public view. But after her lip augmentation, she looks like the joker in batman. She has already stolen lot of money from the offertory and lives in luxury. To add to it, she twists the Bible and preaches a hellish doctrine. In the case of Joyce Meyer, the offertory was used for damaging her lips; where as when it comes to Paula White, she has used the offertory given by the people in the church to have breast implants, face uplift and botox use. A decade ago silicon implants were done by film actresses like Pamela Anderson and the likes to boost their image and to lure the attention of the audience. At least people in the glamour industry used their own money to do all the attachments to their body. But these days people go on to the extent of remodelling themselves using Offertory. Where is your Offertory going? 634. My first shaving experience.